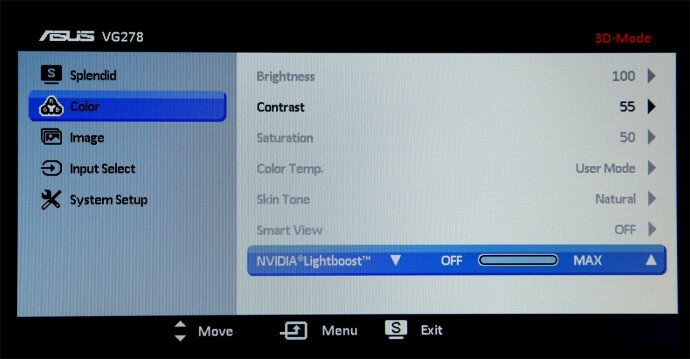 Notice that from the Off state of the Lightboost technology to the maximum level there is almost a double increase of the brightness level and what Nvidia was saying for the new technology was that it will increase the brightness twice. So you can say that this claim is true. Notice that the level of brightness you get with the decreased Contrast to a setting of 55 is the same as the +4 state of the Lightboost setting together with the default setting for Contrast. So you are kind of halving the effectiveness of the Lightboost technology in order to further reduce ghosting/crosstalk. In order to further reduce the ghosting in 2D mode as well you can also play with the Trace Free option of the monitor. The default setting of 60 is quite Ok (the left part of the image above), but increasing it to the maximum value of 100 you get better results (the right part of the image above). You can see from the high-speed photos taken from the PixPerAn test software that the fast moving objects are looking better and have less ghosting with a higher value of the Trace Free function. Is there any downside to increasing the Trace Free value to a 100, Bloody? I wonder how it would look like to turn off the Trace Free function since at 60 we already clearly see the second image! Funny that at 100 the second image become negative. I guess our slow eyes can’t see this anyway. The photos with the different the Trace Free settings are taken with a shutter speed 1/1000 of a second. The negative afterimage looks better as the moving object actually looks sharper with the naked eye and with less Trace Free the fast moving objects looks slightly more blurred. With a setting of 0 for Trace Free the situation looks slightly worse than the default setting of 60. The screen gets up to 427 cd/m2 in 2D mode but only 202 cd/m2 in 3D? I try to stay no higher than 200 nits at home but it’s quite a drop. Could you please tell us if the ghosting is any different in 2D? please can you make a test with all step of tracefree compared from zero to 100? I can’t find this monitor anywhere. I pre ordered from Amazon but who knows how many more weeks it will take before they get a shipment of 10 or 20, and then its time to wait a few more weeks for another 10 or 20.
where can I buy this thing? Just found your website and first I want to say thank you for producing original content and not regurgitating what others have said, thanks. If I understand correctly Lightboost currently only works with LED. LED’s can switch on and off incredibly fast rates. The colorimeter may measure same net cd/m2. So to test this I suggest trying two settings with same cd/m2 one at 100% LightBoost and reduced contrast the other at higher contrast and lowered Lightboost. Then run ghosting/crosstalk test. Is the LightBoost setting just a contrast toggle? Is this suppose to be out right now? I can’t find any online. Other site says Trace Free at 80% is THE GOLDEN MEAN. Can you confirm this, Bloody? I’ve only tested the minimum, default and maximum setting for Trace Free, but I’ll also do a comparison with all of the possible settings. Alright thanks Bloody! Really appreciate it! I guess this will be my first upgrade since the Syncmaster, i’m pretty pumped! Hopefully it comes to Canada soon! I see it listed on a number of Canadian sites like NCIX, but still seems to be at least a week or two away. massaker, yes it seems that 80% is visually slightly better at least on the high-speed still photos of the moving object, but when looking with a naked eye there is hardly any difference visually. After I got the recommendation in the preview article to switch from my acer 27 3d to this one I was lucky and got 3 of the new Asus monitors out of 6 overall here in Germany. First I was a bit disappointed of the ghosting /crosstalk I could see in iracing. But with your tweaks it’s completely gone. The 3d vision glasses are also a big step forward. Thanks a lot bloody! Your work and articles are really appreciated. fantastic comparison of trace free!!! i’m wrong or the 80 setting are better? negative image on 100 setting are too high! With a setting of 80 for Trace Free the afterimage looks more like a faint shadow and with 100 it looks inverted, so a setting of 80 should be slightly better, although with a naked eye you probably won’t notice much of a difference between 80 and 100. I’ve got one on Friday, 11.11. in Germany but – a bad one. The backlight LEDs stayed dark. When knocking on the side sometimes the right side of the display lit with impressive brightness, but the lower left side was dim. Now A hope to get a replacement as fast as possibel…. Thanks for the crosstalk tips Bloody. Really helped to reduce the bad crosstalk scenes. Hey thanks for the update on brighness levels. That was exactly what I was looking for and way more detailed than I dared to hope! Now the only thing I need is some way of comparing the ghosting to e.g. the latest Samsung SA950 model. Sad thing that the Asus is in short supply everywhere these days. I picked up the VG278H this week from NCIX and wondering about it being defective since even to the naked eye the display noticeably darkens when it goes into 3D mode. Can someone weigh in to inform me, is this adnormal?